Scientists know how to turn on these fat-combusting cells. Can these energy burners be used to combat obesity? Brown fat—the form of adipose tissue that burns, rather than stores, energy—was only recently discovered to exist in adult humans. For decades, researchers knew it was present in rodents, whose brown fat reserves are quite large. But it wasn’t until the advent of PET-CT scans that allowed scientists to finally image brown fat in people, about six years ago. In animals, researchers had found years ago that cold fires up brown fat, likely to regulate body temperature. So in Schrauwen’s early experiments to look for brown fat in humans, he asked a group of young, male volunteers to sit in a cold room (16° C) for two hours. 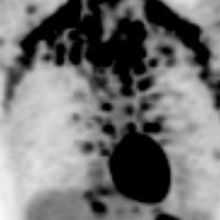 In this condition, brown fat would light up in the scans, but at room temperature, it was not visible. The results demonstrated that it was possible to manipulate brown fat via cold exposure, but would it be enough to produce any benefits? In 2013, Masayuki Saito of Tenshi College in Japan and his colleagues put cold to the test. The team had a small group of volunteers sit in a cold room (19° C) for two hours each day for six weeks. 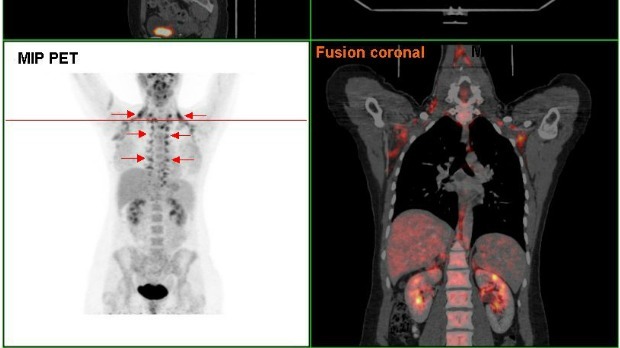 Not only did PET-CT scans show increased brown fat activity, but the study participants’ body fat mass also dropped by a few percent, while control volunteers showed no such changes. 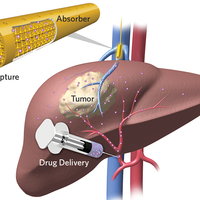 What scientists like Spiegelman really want to develop is a brown fat medicine. The beleaguered quest for a fat-burning pill has spanned decades, with few successes and a handful of huge flops (think: methamphetamine given to postpartum women in the 1940s, and fen-phen’s ban in the 1990s after its potentially fatal side effects were exposed). But no drug-development attempts to date have specifically targeted brown fat, leaving room in the imagination for a safe, effective, and long-lasting weight loss medication. Another target is UCP1, or mitochondrial uncoupling protein 1, which causes brown fat cells to produce energy via heat rather than ATP. 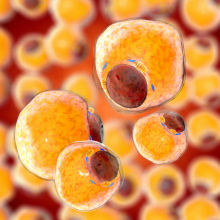 Wanzhu Jin at the Institute of Zoology at the Chinese Academy of Sciences in Beijing is screening chemicals in mouse models of obesity in search of those that turn on UCP1. He has been dosing himself with one such promising compound, used in traditional Chinese medicine, for months. So far he hasn’t observed any side effects, but he hasn’t witnessed any weight loss either. 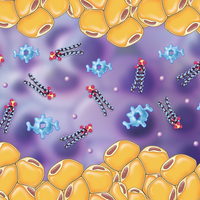 Rather than breaking new ground with novel compounds, some researchers are repurposing old drugs known to stimulate players on the brown fat activation path, with an eye toward honing their specificity. Patrick Rensen at Leiden University Medical Center in the Netherlands, for instance, is reviving interest in a weight-loss drug called rimonabant that had already been on the market, but was pulled for psychiatric side effects. Rimonabant is known to effect weight loss by binding a cannabinoid receptor, but the mechanism wasn’t entirely unclear. Rensen and his colleagues last year showed that the drug works by increasing noradrenergic signaling in brown fat when the cannabinoid receptor is turned off. If it were possible to develop a form of rimonabant that couldn’t cross the blood-brain barrier, he says, such a drug might be promising. Cypess is now experimenting with a β3-adrenergic receptor agonist, mirabegron, which is approved to treat overactive bladder. In January, his team showed that a single, large dose of the drug activated brown fat in adults. The next question is whether chronic activation can produce lasting metabolic or weight benefits. One of the challenges of activating brown fat in people is that adult humans have so little of it to begin with—just a few hundred grams, estimates Rensen. And among overweight and obese individuals, that amount tends to be even smaller. But what if we could boost that volume? A Massachusetts-based biotech called Energesis Pharmaceuticals is working on a different solution to boosting brown fat. It’s developing a procedure to take a bit of fat precursor cells from a person, grow them in the lab, add a compound to differentiate the cells into brown fat, and reinfuse them back into the patient. “We have very good results in mice,” says Olivier Boss, the firm’s chief scientific officer. Time is something investors don’t always have, creating a challenge for those wishing to develop a brown fat drug that could treat obesity. Spiegelman founded a company called Ember Therapeutics several years ago, but despite preclinical success with several compounds, he says, its primary investor pulled out and shuttered the company. “We were making good progress, but we weren’t making it fast enough,” he says. “I still believe in” a brown fat therapy. Spiegelman says he’s in discussions with another investor to continue his work on developing a brown fat drug for diabetes and weight loss. Like Boss, however, he acknowledges that obesity may be a tougher nut to crack. “I’m much more optimistic about activation of brown fat for diabetes and fatty liver disease. Whether we can achieve enough weight loss as a monotherapy, that’s a high bar,” Spiegelman says. Studies on activating brown fat in humans are still so new that there aren’t enough data to say one way or another if it’s feasible to stimulate weight loss by turning the cells on.